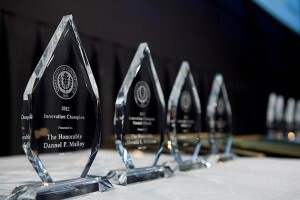 Taking the research done every day at the University of Connecticut from the campus to the marketplace is becoming an ever-greater part of UConn’s mission, as an awards ceremony recognized Wednesday night. 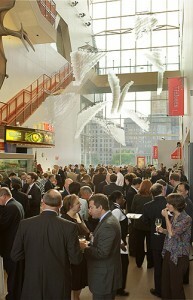 The inaugural Celebration of Innovation event put the spotlight on the University’s growing importance in the larger economy. With laurels bestowed on everyone from undergraduate entrepreneurs to Gov. Dannel P. Malloy, the Celebration of Innovation at the Connecticut Science Center showcased not only the research that’s earning millions in revenue for the University, but the network of partnerships between public and private entities that’s a core component of that work. 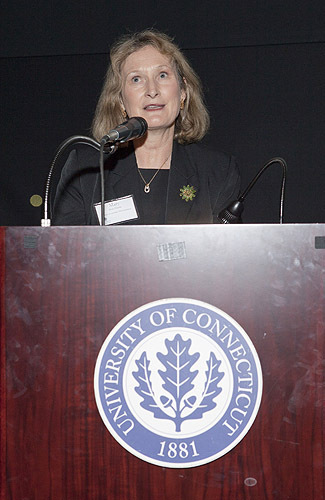 “Economic development is, at base, about brain power,” UConn President Susan Herbst said, as she ticked off some of the University’s recent successes bearing that out: more than 366 patents in the past 20 years, over $4 million in revenue from licenses in the past four years, and a 79 percent success rate with companies involved in the Technology Incubation Program, compared to the national average of 65 percent. “We were pretty quiet on the economic development front for a few years, but that’s changing,” Herbst said. 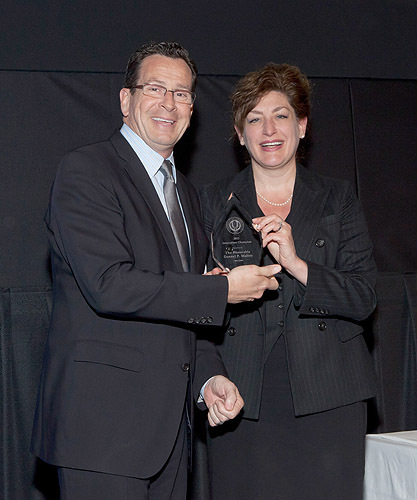 The ramping-up of UConn’s economic development initiatives comes in the nick of time, Malloy told the crowd, following more than two decades of stagnant employment numbers in Connecticut. “We cannot afford in this state to miss any opportunities, because we did it for 22 years,” he said. 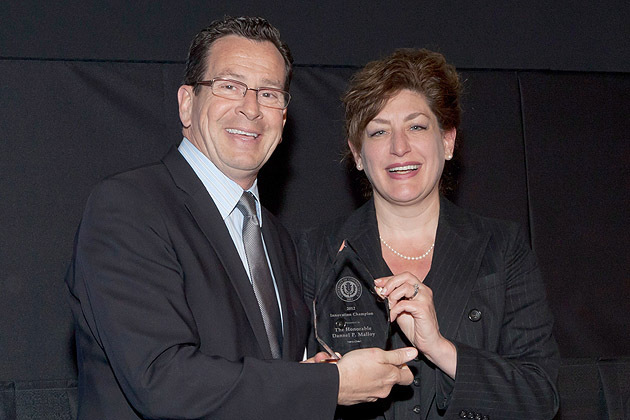 Malloy knows firsthand about the climate of innovation at UConn – his successful gubernatorial campaign hired a company owned by a UConn undergraduate to run its website during the election, for which the company later won an award. “This new relationship that UConn has with state government has the potential to be tremendously important for the state of Connecticut,” he said. Some of the awards handed out Wednesday night recognized some of the early fruits of that partnership. State Senate President Pro Tempore Don Williams was lauded for his work in winning General Assembly approval for a $170 million investment in UConn’s technology park and its first building, a 125,000-square foot facility with laboratory space and specialized equipment. The tech park, which is slated to open in 2015, will ultimately have roughly 1.4 million square feet of research space. Another award recipient was The Jackson Laboratory, the Maine-based genetic research firm that this year signed a deal to bring a billion-dollar facility to the UConn Health Center campus in Farmington, an arrangement that was recently lauded by Site Selection magazine as one of the 10 best economic development deals in the country. That kind of recognition is being keenly observed at UConn’s peer institutions, said Mary Holz-Clause, the University’s first-ever vice president for economic development. “They just look at us in envy and say, this is the place to be,” she said. Awards were also given to Mun Choi, dean of the School of Engineering; Suman Singha, vice president for research; the company Agrivida, which has partnered with UConn and recently invested $600,000 to expand the greenhouse at the Advanced Technology Lab Building; IMCORP, a Manchester-based company founded by UConn professor emeritus Matthew Mashikian with technology he developed while at UConn; to faculty patent recipients; and to student teams that won competitions to develop their own business plans. The sheer range of innovation on display at the awards ceremony is a testament to how much work UConn has done in recent years to expand its profile in the marketplace, said Tony Esposito, chairman of the UConn Research & Development Board and winner of the Alumnus of Distinction award.